Don Chigazola is back with some Barbaresco wines from Italy today on California Wine Country with Steve Jaxon and Dan Berger. Don Chigazola is a wine importer whose company Chigazola Merchants specializes in importing special wines from Italy. 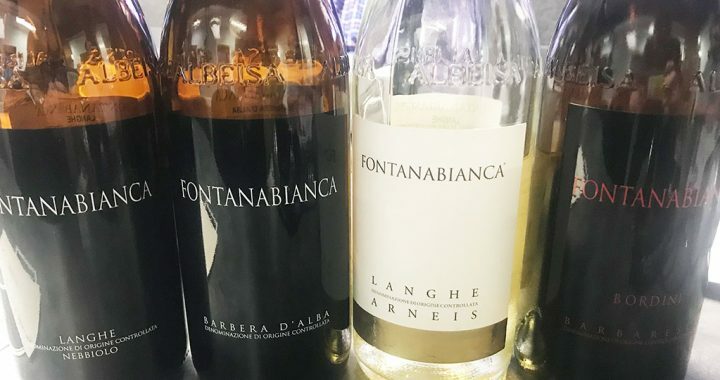 Today has brought some wines from a single family producer Fontanabianca, in the Barbaresco region (in Piedmont, northwest Italy). Don Chigazola studies a glass of Barbaresco in the studio. Don drives the back roads of Italy with his son looking for good local wines. He will establish a relationship with these producers and imports these wines into northern California. He also sells them around the country from his website. First they taste a Fontanabianca Arneis, which Steve thought tasted like a Chardonnay. Dan says Chardonnay can be made seriously or frivolously. He says this Arneis is made seriously. The Arneis variety is native to northern Italy. Don thinks there might be someone growing it in Sonoma County. 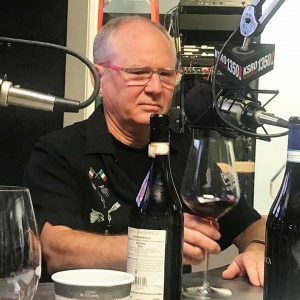 Bob Andrews is Dan Berger’s go-to expert on Italian wine. Bob speaks fluent Italian and he has some great old Italian wines in his cellar. The Arneis is not a simple fruity wine. Arneis is a low-acid grape, with low yields. This retails at $25. Dan thinks it would go with any kind of seafood, which does not use cream in the recipe. Bob Andrews says it’s deliciously dry. It would be great with some shrimp or oysters, they suggest. The alcohol is 13%, which is a point and a half less than most Chardonnays. Next they taste a Nebbiolo from the Langhe district. It has a flavor that you will never get in an American wine. Dan says the flavor has a walnut component in it. It goes great with pasta with sausage, says Dan Berger. The winery is Fontanabianca, of the Pola family, located in a medieval village called Neve. The family has been producing wine for generations and the grandfather was the first to commercialize it, in the 1960s. His son, his wife and their son take care of all the production today. Don was travelling in Piemonte, looking for a good Barolo to import. He discovered a small hotel called Castello di Sinio run by a San Franciscan, Denise Pardini, who has built a 5-star hotel in a rennovated castle . Don was looking for Barolo but she suggested he find a Barbaresco. She introduced him to the Pola family and they made a visit. Don loved all of their wines Nebbiolo, Barbera d’Alba and their flagship, Barbaresco, named Bordini. Dan tells about the differences between the Barbaresco and Barolo wines. Nebbiolo also goes into Barolo, as well as Langhe Nebbiolo, a lower priced wine that doesn’t have to age as long. Don explains that the Nebbiolo is aged 6 months in oak. The Barbaresco is a DOCG which requires 18 months aging. It goes for $60 per bottle. Dan Berger says this one is two steps ahead of the others. Dan was buying Barbaresco a few years ago and he thought they all needed 25 years in the cellar. This is a 2010 vintage. After the break they taste a Barbera, which Dan Berger says can be drunk now or put away. It has less tannin and more acid. Bob notes that the Barbera has more color than the Barbaresco. Steve likes the Barbera more than the Barbaresco. Next they have a 2013 Barbera d’Alba. Dan says this one is the way Barbera should be made. It doesn’t require a lot of time in the cellar, but it can bear 6-8 years. It has less tannin and more acid. Dan explains that acid it tart and tannin is gritty. All red wine has tannin, but it’s not particularly necessary for certain wines. Beaujolais has very little. This wine has a balance between the acid and tannin. Dan says the tomatoes in a pasta sauce have acid as does the wine, so they would pair well. A Cabernet Sauvignon would not go so well with the same dish. Bob points out that this Barbera has more color than the Barbaresco, but this has more tannin. Dan says ten years from now the Barbaresco will be in better shape. Dan explains that there are three designations of Barbera, Barbera d’Alba, also Barbera d’Asti, which are neighboring districts. Don says you can always tell them apart. The Barbera d’Asti is very astringent. Now there is Barbera di Nizza, too. Don mentions that some of his wines are available at Bottle Barn too. Bob notes that all of these wines have a wonderful sense of place, these coming from Piemonte, northwestern Italy, called Piedmont in English. Dan Berger says, forget trying to master Italian wine. There are so many grape varieties, more then 400 native Italian varietals! Don Chigazola says it’s his mission to cover them all. “Native Grapes of Italy” (published by University of California Press) is a new book by Ian d’Agata that lists over 400 native Italian varietals. Don Chigazola says that book has become his go-to book that he consults before a trip to Italy. It came out about a year ago. Dan Berger also mentions a 1980 book called Vino, written by Berton Anderson. It was very well written and very erudite. Dan Berger remembers landing in Italy late at night and found a restaurant open. He asked for the wine list and they replied “rosso o bianco” red or white. He took red, and was asked “riserva o normale?” He took the riserva. He says it was still fermenting! It was an Oltrepò Pavese (which can be slightly frizzante).